This item is currently on backorder from the manufacturer. Orders placed, will ship when back in stock. 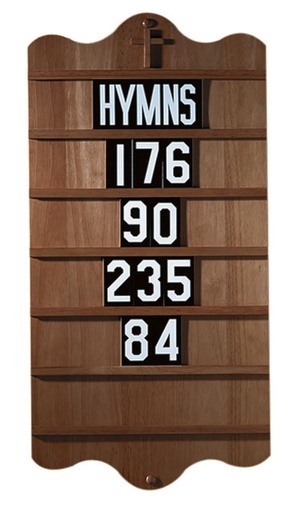 Built for the budget minded church, this wall mount hymn board is sure to add grace and charm to any church. Made of Maple Hardwoods and finished in a beautiful walnut stain. Measures 16" x 32" H. Includes 5 sets of 3-1/2" numerals and the word "Hymns". Built for the budget minded church, this wall mount hymn board is sure to add grace and charm to any church. Made of Maple Hardwoods and finished in a beautiful walnut stain. Measures 16" x 32" H. Includes 5 sets of 3 1/2" height numerals and the word "Hymns". Shipping limited to the United States. Robert Smith Church Furniture is sturdy, constructed of solid wood and designed to give many years of durable service.